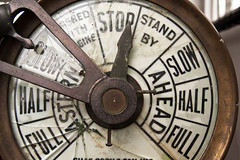 An engine order telegraph or E.O.T., often also chadburn, is a communications device used on a ship (or submarine) for the pilot on the bridge to order engineers in the engine room to power the vessel at a certain desired speed. In early vessels, from the 19th century until about 1950, the device usually consisted of a round dial about nine inches (~20 centimetres) in diameter with a knob at the center attached to one or more handles, and an indicator pointer on the face of the dial. Modern E.O.T.s on vessels which still use them use electronic light and sound signals.